Remove corn from the cob, toss in oil with salt and broil for about 5 minutes to char. Dice all of the other salsa ingredients, juice the lime, and combine. Refrigerate until you are ready to eat. Blanch the quinoa in boiling salted water for 4 minutes. Strain. Dice the red onion and garlic. Cook the onion in oil until lightly browned. Add the garlic. Add the blanched quinoa and cook on high to toast, stirring often. When you start to see some browning on the quinoa, add the rest of the ingredients and simmer about 5 minutes. Chop and broil the zucchini with some oil to lightly brown. Warm the beans and shred the cheese. Heat up the taco shells. Assemble your tacos and enjoy! Around this time of the year where I live in New England, it’s important to really take advantage of the short window of amazing summertime vegetables. I have probably eaten corn 5 times this week, but I don’t even care! It’s all super fresh and local, and tastes great with just some salt and pepper. With veggies this good, you don’t have to do much to make them taste amazing. That's where these tacos come in, with simply prepared fresh veggies all wrapped up in a shell. At the base of the taco, some refried beans and a spicy green chile and chipotle quinoa. I swear to you that the quinoa in these tacos is so filling and flavorful, your meat-loving friends and family won’t even realize they are eating something so healthy. 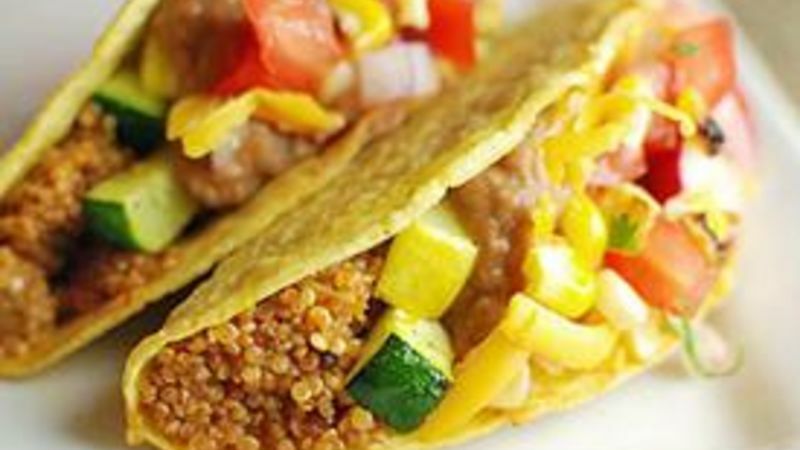 Try these Quinoa and Summer Veggie Tacos soon, before the bounty of vegetables is done for the year! First I blanched the quinoa for a few minutes just to prevent it from getting all starchy and clumpy in the recipe. Sauté some onion and garlic, then add the blanched quinoa. Toast the quinoa by cooking it on high heat for a bit without adding liquid. This added a unique texture and flavor to the grain. Finally, season it with some green chiles and chipotle. Some corn tossed under the broiler to char. Fresh radishes round out this salsa nicely. The flavors are as bright and vibrant as the colors! Finally, a quick broil on the zucchini gives it just the right texture and flavor to compliment the rest of the taco. Dan Whalen could eat corn every day in August. He has been blogging for over four years at The Food in My Beard; check Dan's Tablespoon profile often to try his recipes with creative international spins!